While exceedingly convenient, indoor plumbing can require some routine maintenance not only to keep it clear, but also to reduce the possible odors that result from mold growth on debris lodged in the pipes. 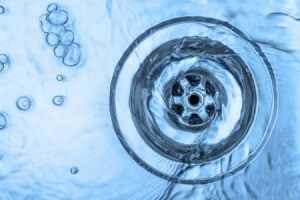 This is a guide about cleaning sink drains. I was in Walmart the other day and saw drain snakes hanging in the aisle with the cleaning supplies. I don't know if this is a new item or I have never noticed it before. I have been looking for something like this for a long time and I grabbed it. The price was $2.98. I used it to clean the overflow spouts on the bathroom sinks. Now they are smelling fresh and clean. 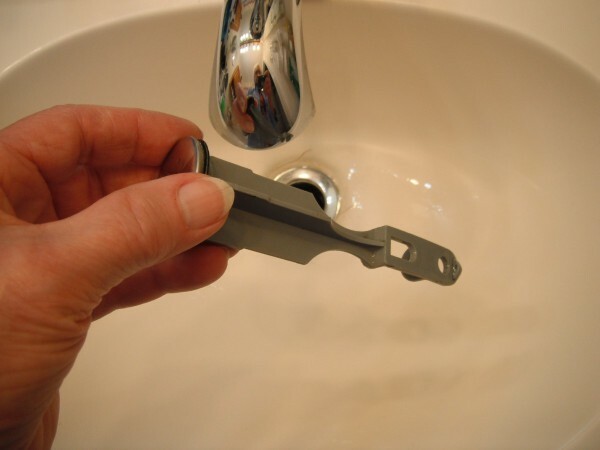 It can also be used to clean the sink drain but I don't have to use it for that because we do not have the sink stoppers attached. All I have to do is lift the stoppers out and clean the drains with a baby bottle brush. The stopper works great without being attached. Just press it down and it will hold water in the sink. Use the lever to lift it up. The ZipIt drain cleaner is great on hair. Cheap to buy at hardware store. They say to throw them out after use, but i rinse mine and hang it up. Like a lot of others who have asked similar questions, I too have moldy and bad odors coming from my drains. When we shower or run the water, or let the water out, there is a bad odor, and moldy odors that travel throughout the house through the AC vents. I can see the mold on the inside of the PVC pipe in one side of the kitchen drain. I have tried bleach, and baking soda and white vinegar. When I have mold start on the caulk on the side of the tub, I spray bleach on it, and it sets and gets rid of the mold. But how can I plug up the inside of the sink drain, so the bleach or whatever, can set right there on the mold to soak it and remove it. 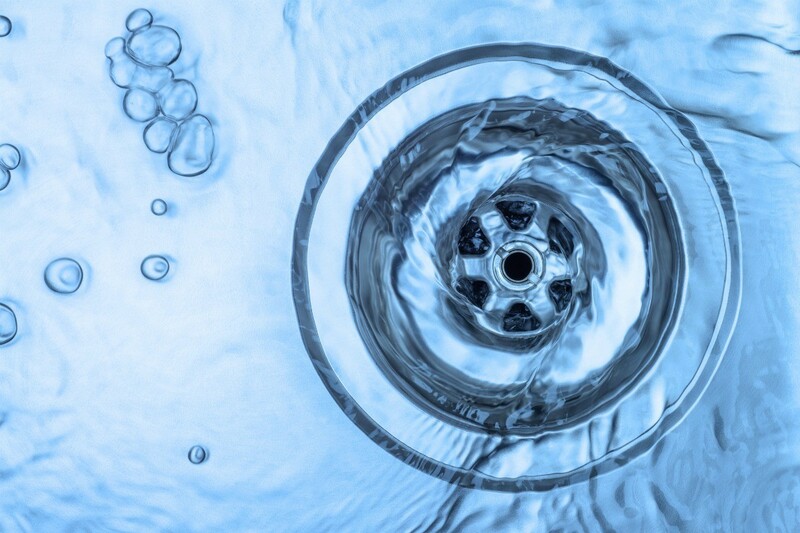 Anything poured down the drain just runs off and can't set on it and soak it. Is there something that I can put down the drain to temporarily plug it up in there, so the bleach can soak the mold loose off the inside of the drain? Something that could dissolve slowly. A plumber wants to sell us a $50.00 gallon of stuff, but how can it soak it if it just runs on down the drain? I wish I could get a small scrub brush down the drain to scrub he mold off. Thanks! I had the same problem a few years when I went away to Holland to stay 2 weeks with one of my sons. When I returned there was a horrible odour in the kitchen, before I filled the kettle for my cup of tea, I had a good look at the little drain-hole in my steel sink, it had a wee screw in the middle; I got a screw-driver and removed same, then took the fitting off, poured bleach and bicarb soda and lemon juice in to the hole, and with a thin bottle brush scrubbed all down the insides (the amount of black that came off was quite a surprise). Boiled the kettle up and poured this down the plug hole. Then put everything back in place in the plug hole and screwed the wee screw back in the sink hole. What a lovely odour I had ever since. Try this, it worked for me. Cheers, Geraldine in Coventry West Mids. PS Be sure to insure the wee screw is tightened securely, or else you will have a leak! 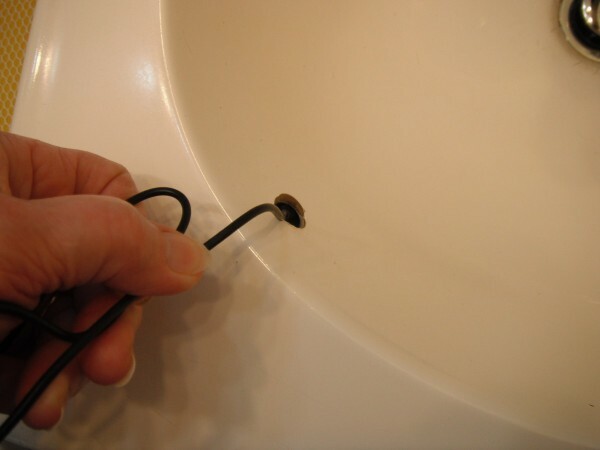 What is a simple way to clean out lavatory drains? Most likely it's hair that is plugging it up. If you can get one of the old time spring this that closes a screen door. 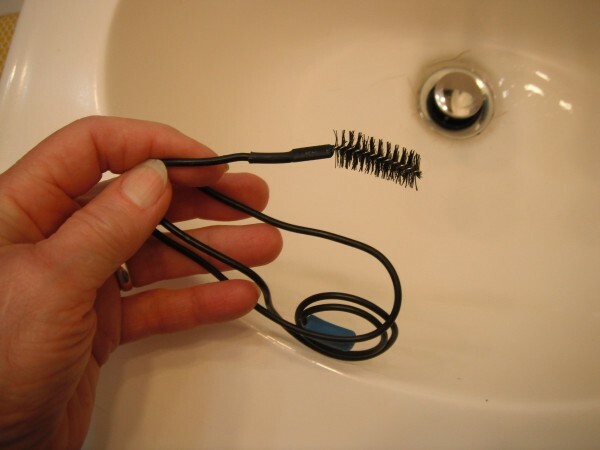 Stretch it out so it still has a curl in it and just run it down in there and turn it like a auger it will clean it out.